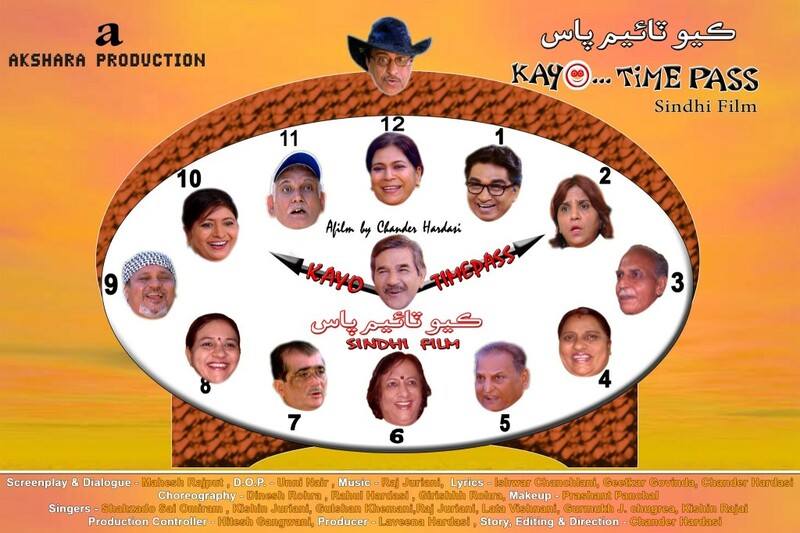 After successful direction of two Sindhi movies “Jeevan Saathi” , “Jeevan Chakra” Chander Hardasi is releasing new Sindhi Movie “Kayo Time Paas”. Earlier two movies were produced by Dilip Lalwani. 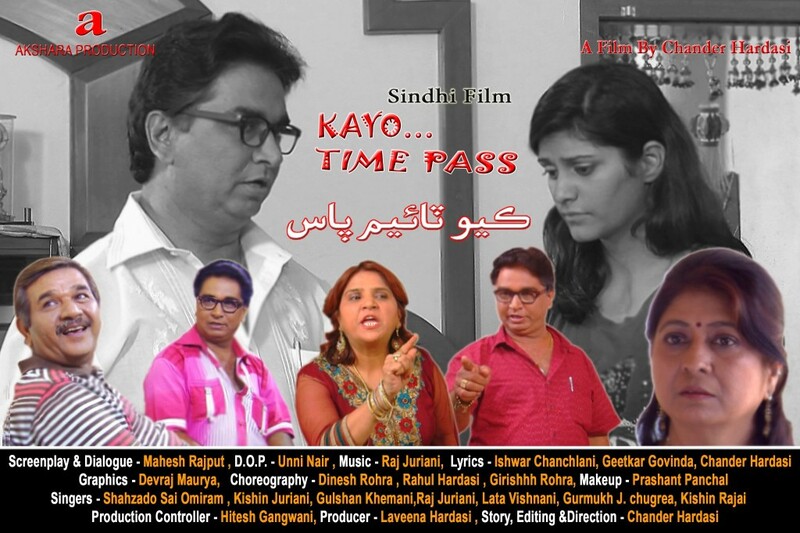 “Kayo Time Pass” is releasing under his own banner “Akshara Productions”. 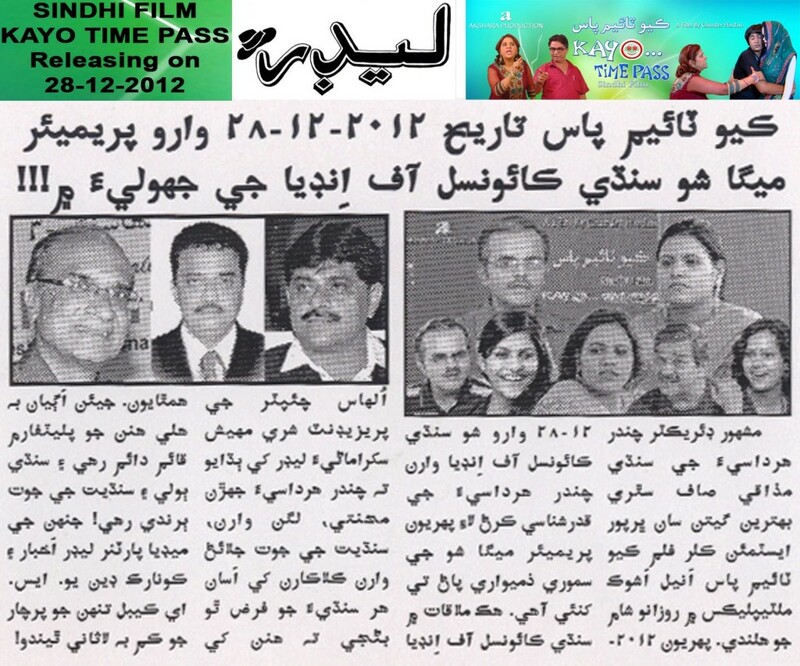 You must also note that this movie is releasing in theater with the co-operation of Sindhi Council of India, Ulhasnagar. 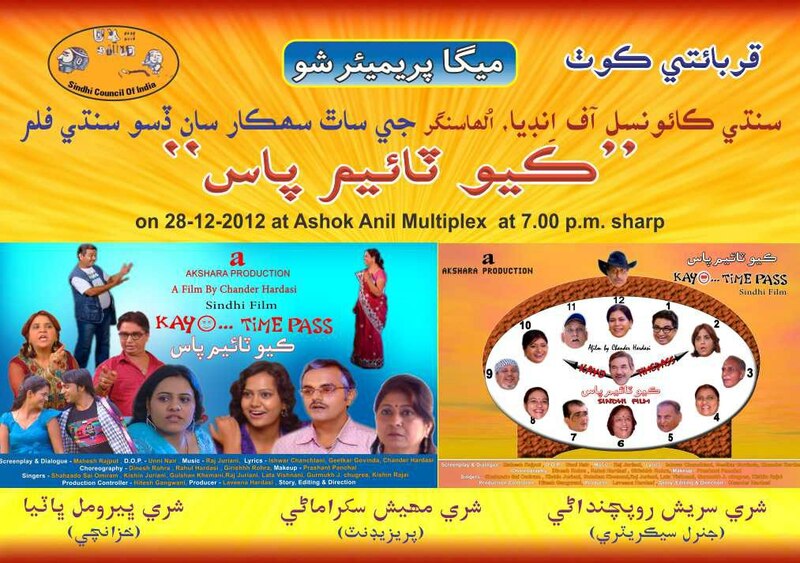 “Kayo Time Pass” is releasing today (28-Dec-2012) in Ashok Anil Multiplex. There will be one show daily at 7:30pm. In coming weeks the movie will also be released in Kolkatta, Raipur, Kolahpur and many cities across India. This movie highlights the life of ageing senior citizens, who are left alone by youngsters. With difficulties to earn livelihood & growing expectations in society youngsters has started ignoring elders in family. Movie shows rather than expecting something from youngsters senior citizens has formed their own group named “Karyo Time Pass” where they find ways to be happy. They entertain each other by playing childhood games & celebrating birthdays of family members. Movie takes you through ups and down with many comedy & emotional scenes. Movie also has love story where a foreigner visits and stays at one of the members home. Shahzado Sai Omiram Saheb from Sai Vasan Shah darbar has blessed the movie with guest appearance in the movie and also sung one song. There are 6 songs in the movie. Lyrics are written by Geetkar Govinda, Ishwar Chanchlani & Chander Hardasi himself. Catchy Music is given by Raj Juriani. Songs are sung by Shahzado Sai Omiram, Kishin Juriani, Gulshan Khemani, Raj Juriani, Lata Vishnani, Gurmukh Chugria & Kishin Rajai. Overall this movie can be enjoyed by all the age groups and has giggling moments for all. A must watch for every Sindhi. “Kayo Time Pass” title song from movie.